Patricia Dowling Froggett, Ph.D. is an Education Program Director and faculty member of the University of Virginia, School of Continuing and Professional Studies, at the UVA Northern Virginia Center. She holds a Ph.D. in Adult Education and Human Development from Virginia Polytechnic Institute and State University, as well as Master’s degrees in Curriculum & Instruction and Education Administration, also from Virginia Tech. Dr. Froggett has direct hands-on classroom teaching experience at the graduate, undergraduate, and secondary school levels for the University of Virginia, George Mason University, and secondary schools in New Jersey, Virginia, California, and Japan. Dr. Froggett’s exploration of hostile resistant behavior in the learning environment was recognized by the International Society for Educational Planning (ISEP) in 2008. This research became the foundation of Resistance to Learning. 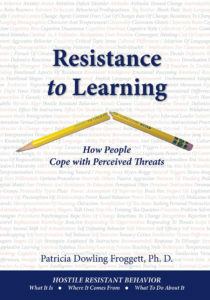 Resistance to Learning: How People Cope with Perceived Threats by Patricia Dowling Froggett, Ph.D.